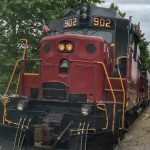 FOR THAT ULTRA RAIL FAN – Here is your chance to ride in an actual working locomotive. We have one seat available inside the cab of our Cincinnati Dinner Train 1962 GP-30 locomotive for that rail fan looking for the ultimate train experience. If dining with us, enjoy your meal at your table in one of our three dining cars , or perhaps you are joining us on the initial portion of our ride in our coach car on the way down to Theodore Berry Park on the riverfront. Then before we depart for the trip back to our starting point, you will be provided with a safety vest and safety glasses and escorted to the cab by one of our conductors. There you will have a front row seat next to the engineer for the twelve mile, hour long pull back to our loading area. The engineer will explain the workings of the locomotive and all of the safety measures he is required to know and practice. His conductor will occupy the third seat behind you and will also be available for questions and commentary. The rider is required to be at least 18 years old and must wear long pants and closed toe shoes. Ticket price – $150.00. Cab ticket must be purchased in addition to either a dining ticket or coach ticket. Cab Ride ticket can not be purchased just by itself. Cab rides are limited to one per Saturday evening. Advance booking suggested, based on availability.